We're getting swamped with action figures, toys and collectibles based on this summer's many, many block buster movies. I've already started with reviews of several Indiana Jones items, I've seen Kung Fu Panda toys, and the flood gates should open today with even more stuff including The Dark Knight. 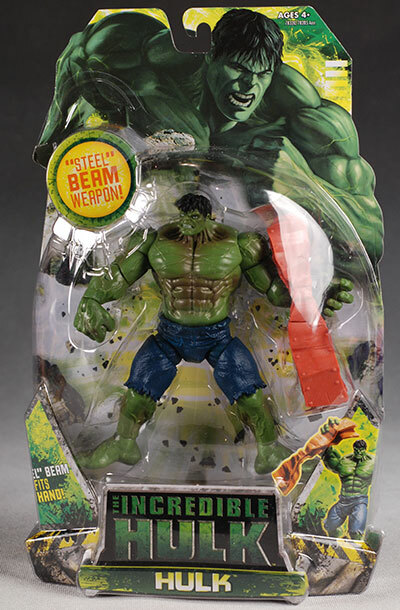 One of these summer blockbusters getting the action figure treatment is The Incredible Hulk. Feeling a little deja vu? Yes, we already had an Incredible Hulk move, just a few years ago. Technically, Hulk wasn't 'incredible' back in 2003, just the 'Hulk', at least when it came to the movie title. And the movie was anything but incredible, unless you count 'incredible bore'. With all the other Marvel properties doing a bang up job at the box office, it was no surprise that there would be a sequel to the first Hulk film. However, the folks involved with this film (including star Edward Norton) realized the first film blew chunks, and reworked the story to turn it into a reboot, telling the origin in flashbacks to severe it from any ties to Ang Lee's film. Perhaps the coolest thing about new Hulk film SPOILER ALERT! is that Robert Downey Jr will have a cameo as Tony Stark, the role he'll be handling in Iron Man this weekend. This gives weight to the discussions that Marvel characters will begin to cross over into each other's films, building a stronger overall film universe. Cool! END SPOILER! I picked up two of the new Hulk figures based on the film, regular Hulk (there are two other versions of Hulk in the fist wave) and Abomination. I grabbed these at Target for $10 each, but you should find them at other major retailers over the next week or so tops. Hasbro does a nice job with most of their mass market releases, giving each of them at least a bit of personality. I like the front shot of the Hulk, and there's plenty of info on the included accessories. There's also some nice personalization on the back of the card for each figure, as well as small photos of the other figures in this first wave. The packages are also pseudo-collector friendly. You'll have to cut the bottom of the bubble to free the figure, but you can just cut the tape on the sides to get the insert out. There's no twisties - Yea! - and you don't have to separate the bubble from the cardback to get him out and put him back in. It's not completely damage free, but it's pretty close for a mass market carded figure. While the sculpts on both figures are decent, there were a couple issues I had with each that kept them away from higher scores. I like the body work on both, with plenty of detailing in the veins, striations, and ligaments. The muscle definition seems appropriate, as do the body proportions (size of the hands and feet to the rest of the body, etc.). Both of them have issues though when it comes to the size and placement of the heads on the bodies. Hulk's head is a bit too small, even for this particular version. 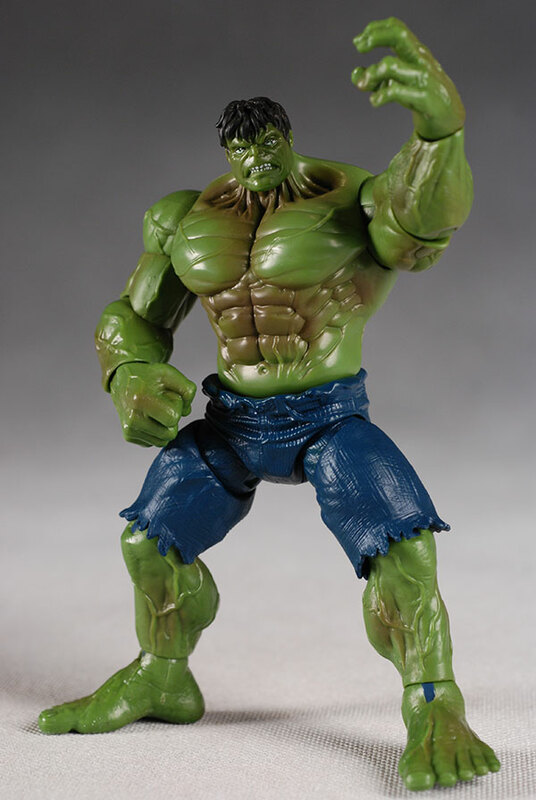 We know from the trailer and early artwork that the new movie Hulk is going to be a bit of a pinhead, but they went even smaller than that by about 15% or so for the toy, making him look like he has a normal sized head (for this scale) on a massive body. The Hulk's head is also on a straight up neck, lifting it up off the shoulders, accentuating the small size. 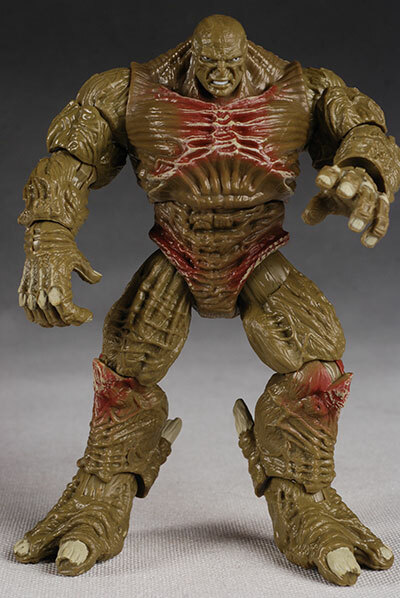 Abomination also has a bit of an undersized head, although his seems a smidge bigger than Hulk's. For him, it's not so much the size as the placement. In the film, Abomination appears to have a longer, thick neck that pushed his head up and out from the body. On the toy, they sort of pushed up the shoulders into the neck, and placed the head right on the front of the neck and torso, with the chin resting right on the chest. 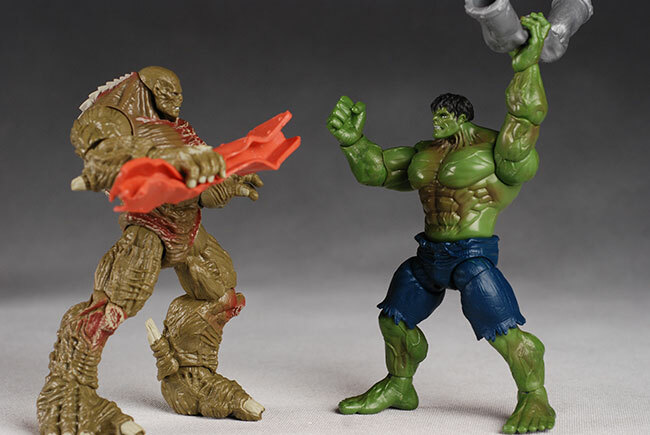 The Hulk is 6" tall, while the Abomination is about 6 1/2". 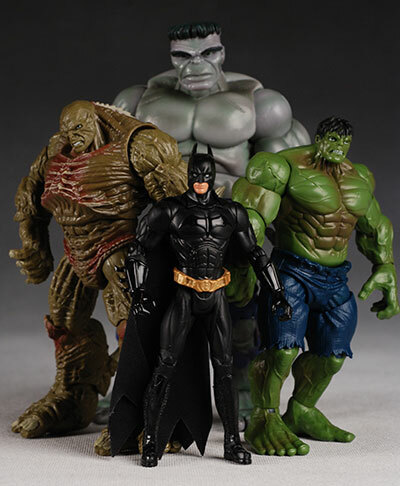 I wouldn't call these six inch scale (1/12) though, since the Hulk should be at least 7 feet tall. In fact, while people might have been initially excited to hear these would be six inches tall, that really means that they are more properly in scale with the various 5" movie lines rather than something like Marvel Legends. Both figures stand great on their own in a variety of poses, and the hands have been given interesting sculpts that can work in various gestures, or can hold the included accessories. Both paint jobs are relatively clean, and have that mass market consistency to them, but there's a couple more issues with the Hulk than the Abomination. Bommie has more detail work than the Hulk, with not just teeth and eyes painted, but toenails, fingernails, external spine and spurs, along with some nifty lighter highlighting on the rest of his exposed skeletal structure. What work is here is clean, but as you might expect from Hasbro these days, much of the figure is merely cast in the appropriate color. Since he's predominately green, that's not too much of an issue, except for the slightly glossy look of the plastic. I docked Abomination for somewhat weak eyes as well. Hulk has even worse eyes, with poorly painted pupils on both. Hulk has fewer details, but does have nicely painted teeth. They tried to give him some darker shading on some muscle areas, but this really doesn't work for me. They also left the discs at his knees and ankles the same color as his pants, rather than in green, which is distracting and unnecessary. They cast the discs at his elbows, wrists and shoulders in the right color, why not the leg joints? These are super articulated. I know this to be true because the package tells me so. The Hulk does pretty well in this category. He has the disc/pin neck similar to the ML line, and it turns and goes forward and backward pretty well. He has good ball jointed shoulders and hips, both jointed on both sides of the ball. The elbows, knees, ankles and wrists are all the pin/post style of joint that is really like a one sided ball joint. It allows the joints to turn 360 degrees, as well as move forward and backward on the disc. Finally, he has a rocker waist joint that works well, allowing him to tilt and turn with a pretty wide range of movement. Abomination says he's super articulated on the package too, but he's not quite as super as the Hulk. Perhaps this is what proves to be his undoing in the film - "Damn, if I just had a better neck joint, I could have seen that coming!" 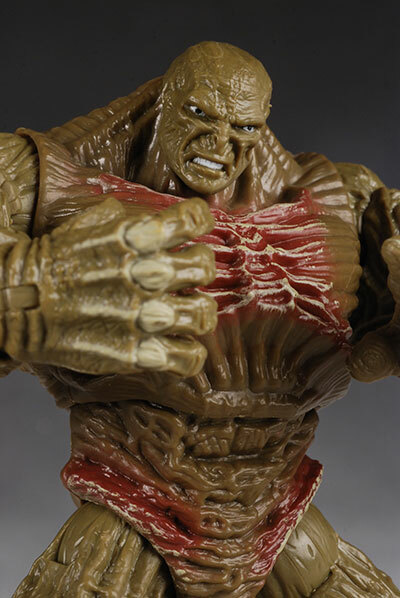 His neck operates as a simple cut joint, but he has similar shoulders, elbows, wrists, knees and ankles to Hulk. His hips are single ball joints (or pin/peg joints if you will), so they don't have quite as much poseablity as the Hulk's, and his chest joint doesn't tilt as well. Both figures hold plenty of poses though, and with only a couple minor issues, they have about as much articulation as you really need. It's also largely well hidden (with the exception of the Hulk's funky disk colors on his knees and ankles), and the sculpt and joints are designed to work well together. Each figure comes with one accessory. For the Abomination, it's a hunk of pipe, bent in the middle by his ferocious right hand. For the Hulk, it's a hunk of steel girder, likewise bent. It looks to me like these two guys had themselves a squeezing contest, and nobody won. Both items break in half, but the pegs are a little short and a little soft. Rather than pop apart when they strike each other, they're probably going to simply fall apart on the slightest touch, making them more frustrating than fun. Now, before I get a couple thousand emails, yes, I know I switched the accessories around between the two for the photos. I don't think they care, so I didn't either. If your kids get a little too frustrated with the pipe/girder falling apart, you can always glue them, and they'll find the articulation and solid, well built figures a lot of fun. While there are far better versions of the Hulk (and even of Abomination) out there, as movie figures go, these are actually pretty solid toys. Unfortunately, it seems that the average mass market price has jumped to $10 a figure, at least for Hasbro's six inch stuff. With only one accessory each, that's a good two bucks more than these are really worth. Pity the poor kid that's trying to buy action figures on an allowance. As with most mass market lines designed for kid's and play, there's not much to worry about here. While the paint isn't perfect, at least it's consistent from one figure to the next, and the figures are made to withstand not just handling but rough play as well. 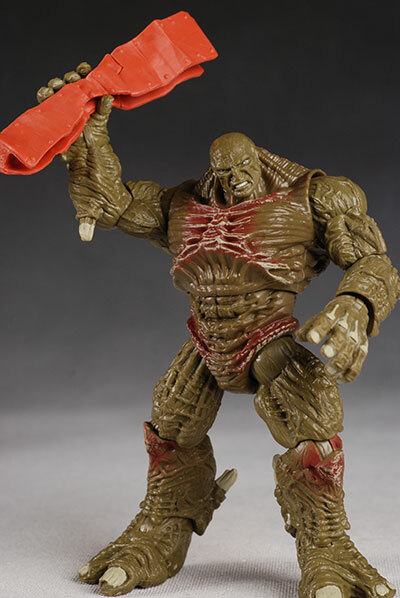 Of the three versions of Hulk figure in this wave, I thought this one was the best looking. He had the least goofy paint job, and there was no silly action feature to get in the way of the looks or playability. If I cold only get one Hulk figure, this wouldn't be it by a long shot, but this does provide collectors and kids who have been picking up the various Spider-man and villains figures in the 5" scale to have a reasonable Hulk to go with them. And if you're into the film (and I can guarantee this version will be better than the last), then you might want to give the Abomination a second look. He has a couple minor issues, the biggest being the weird placement of his head on the front of the neck/torso, but he can fill in as another reasonably interesting villain in your 5" world. This line isn't going to set the world on fire, and the paint work is the weakest link, but if you have a fair share of the smaller Spider-man (or Batman, or Superman, etc.) figures, the regular Hulk will fit in nicely. As I mentioned, these should be hitting mass market stores as we speak. Or as I type, and you read. 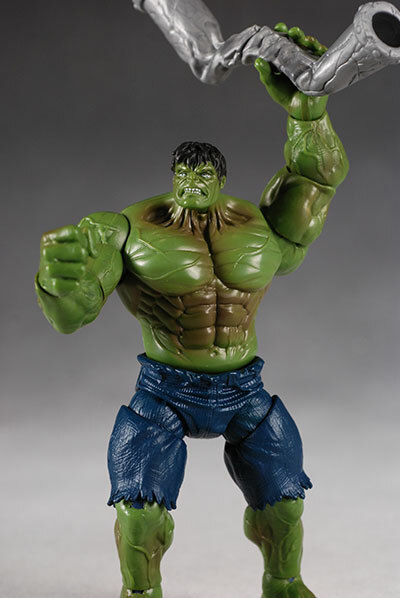 - one of the coolest (and most expensive) Hulk collectibles you can get is the Sideshow Premium Format figure. - perhaps the best truly 6" scale version ever done was in the Marvel Face Off two pack with The Leader. - for the unusual, don't forget Spider-Hulk. 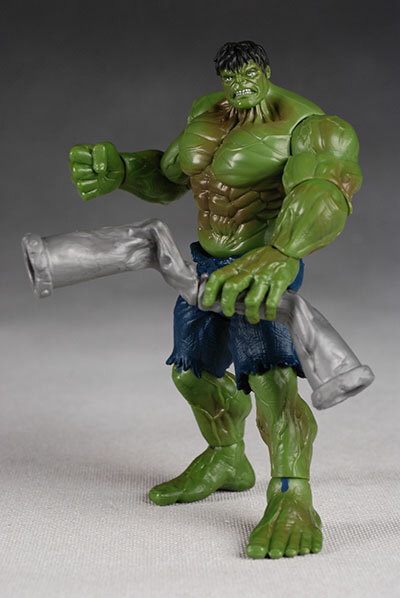 - back around the time of the first movie, Toybiz had their Incredible Hulk line (or Hulk Classics to some), including Gamma Punch Hulk, War Hulk, Mecha Hulk, super poseable Hulk, a more traditional version of Abomination, as well as Joe Fixit and Smart Hulk. - there were also movie specific figures, like Leaping Hulk. 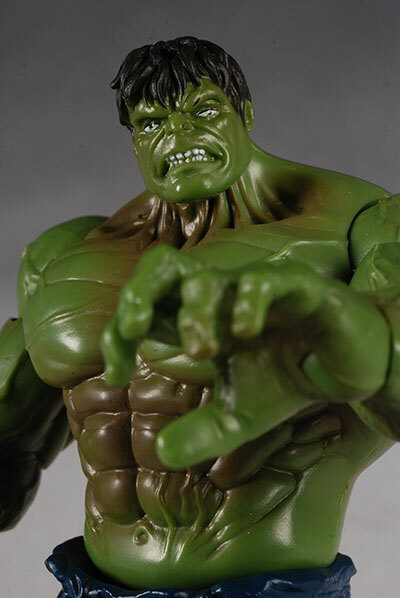 - in a larger scale, there was the Marvel Select Ultimate Hulk, and the very popular 13" movie Hulk. 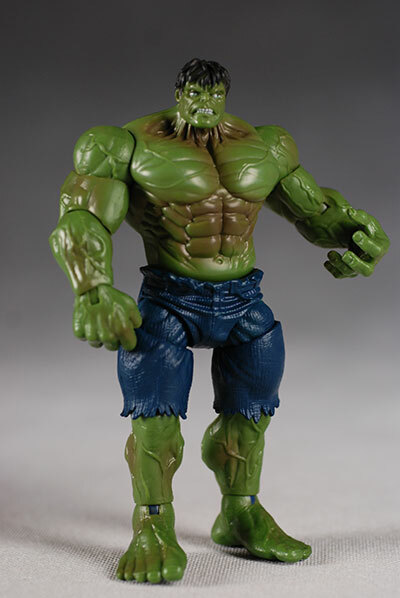 I never reviewed him, but my favorite larger Hulk is the Marvel Icons version.